I am a Chino Hills-based attorney with extensive experience and excellent reputation for effective legal representation in California immigration cases. Working with me, you, your family member, or your friend, will benefit from my experience, knowledge, and desire to see my clients succeed. From the moment you become my firm’s client, you will be in direct communication with me. I will regularly keep you updated on the progress of your case. Your calls or e-mails will be answered promptly. You will also be able to schedule an appointment with me at your convenience to discuss your case. You will get the most important thing you seek from an immigration lawyer: honesty and integrity. As your immigration lawyer, you can expect three things from me: personal and individualized attention to your case, professionalism, and accessibility to a lawyer. If you are not a legal citizen of the United States, you may need to apply, with legal paperwork for a green card, work visa, family, or visitor’s visa. If you are an illegal trying to get your American citizenship, you must prove yourself to be of moral character. If you are arrested for a crime while in the process of your paperwork being processed, you run the risk of being turned down and possible deportation. 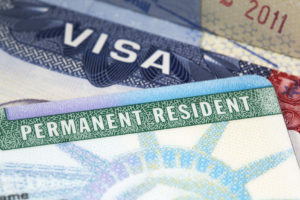 If you have failed to pay child support ordered by the court, or committed prostitution, drug trafficking, or other criminal offenses, you may be disqualified for naturalization in the United States. If you have been detained by immigration you may have little recourse to remain in the United States.